Central Railroad of New Jersey No 592, Baltimore & Ohio Railroad Museum, Baltimore, Maryland, August 1979. 'Camelback' 4-4-2 built in 1901 by the American Locomotive Company (ALCO). As with the earlier B & O 'Camel' type, the very large firebox, designed to burn waste anthracite, forced the engineer to perch atop the boiler in his cab; the fireman was in the usual position. Camelbacks were dangerous and impractical, and were eventualy outlawed. 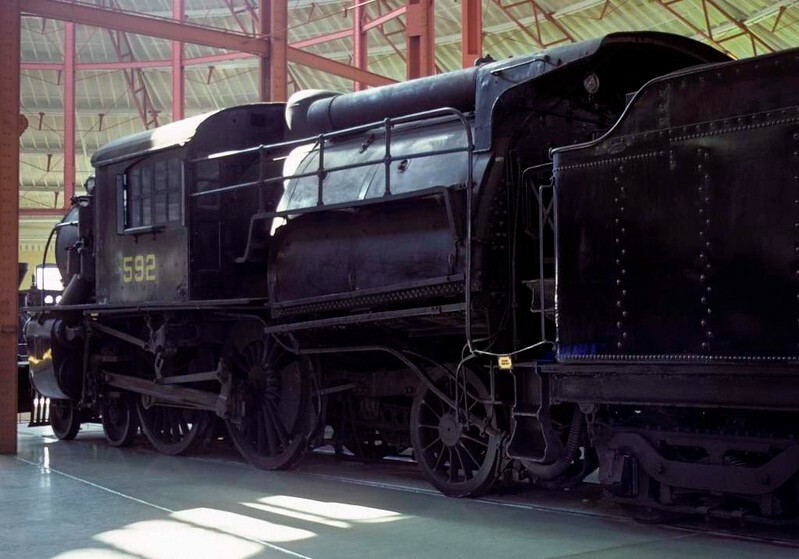 Even so, No 592 was not retired until 1949. Photo by Les Tindall.